3) The electric bell consists of coil which act as . 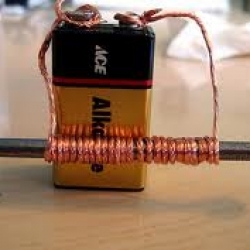 4) Take a nail and wind a copper wire around it without any overlap, as shown in the figure.This is the___. Construction and Working of an Electric Bell Circuit. 5) One end of the coil is connected to one terminal of a battery, and the other end to a steel rod that acts like a spring for the hammer touching the screw contact. 6) Power Lift, Electric bell, Electric Fan are the applications of Effect of Electric current. 9) The hammer is pulled back to its original position due to the of the steel rod, and then touches the contact again to complete the circuit. 10) The circuit is completed and current flows through the coil again, and the hammer strikes the bell again.